Smart speakers have quickly found a place in our homes and more so than ever, we are talking to inanimate gadgets that can respond quickly or play back our favorite music. But when it comes to the actual speakers and the smart assistants that come with them, there are some important differences. That is why we are summarizing the most popular home smart speakers this year and looking at their pros, cons and everything worth knowing. Read on. Amazon basically established the smart speaker category in 2016 with its Amazon Echo, and since then, the company has been leading the way with a wider and more diverse portfolio of smart speakers and even screens. Amazon's Echo speakers are powered by the Alexa voice assistant and their biggest convenience is just how easy it is to order things on Amazon with them. You can also easily augment the speaker by connecting different smart home gadgets and accessories that you can control via the speaker and Alexa. Things like the Philips Hue color lights are one prime example, but many others too. You have three different sizes of the Amazon Echo and as they grow bigger, so does the price, but also the sound quality that comes from each speaker. The tiny Amazon Echo Dot has gotten reinvented with a more home-friendly look in 2018 and it features three different colors of fabric to choose from, so it can easily blend with your decor. 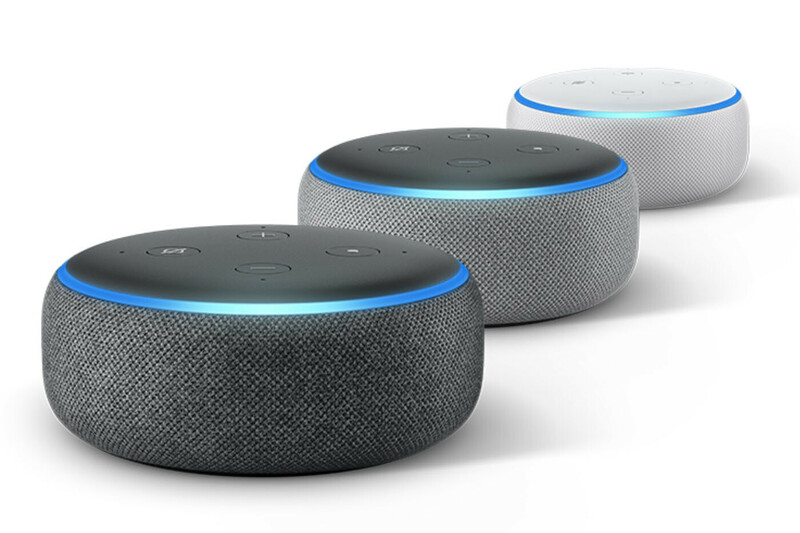 Compared to earlier generation Echo Dots, the current one brings a big improvement in terms of sound output as it gets noticeably louder with fuller, more pleasing sound. The signature Alexa ring that shows you when it's working is still here and looks as modern as you'd expect. 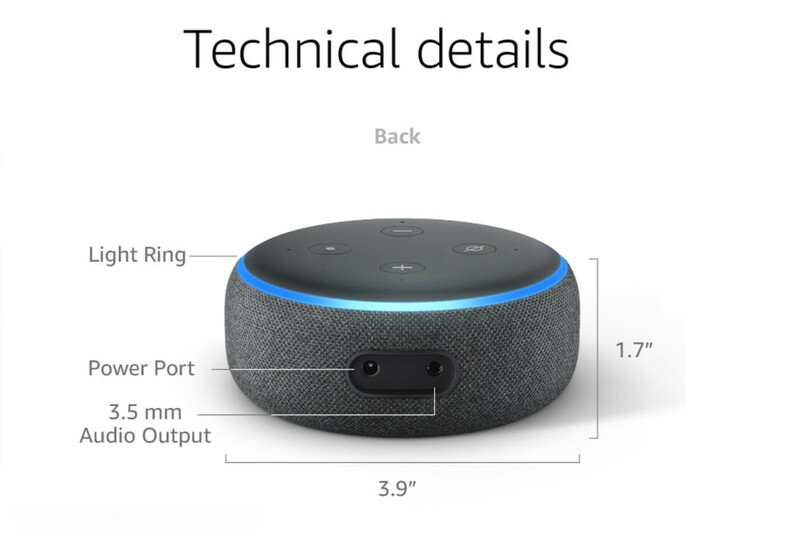 Most importantly, the Echo Dot keeps the AUX port (marked as 3.5mm audio on the picture), so you can easily connect it to your existing non-smart speakers and make the smart with Alexa and this cheap gadget. We are also happy that within easy reach on the top is the mute button that you can press to make sure Alexa is not listening to anything private you may say. 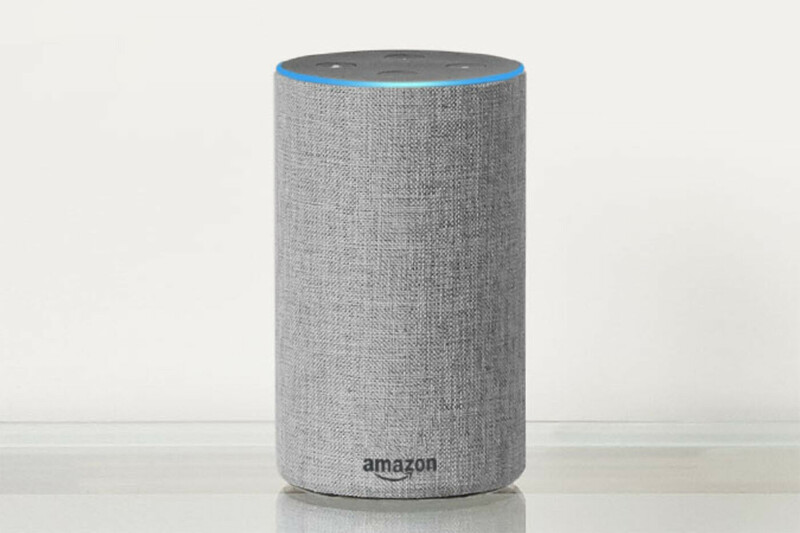 The Amazon Echo is the original Alexa-powered speaker and it also has a home-friendly look that is even more versatile than the Echo Dot: in addition to the different color fabrics, here you also have different wood finishes with a darker and lighter wood tones. The Echo is an excellent compromise between sound quality and price as it brings bigger sound than the Dot without breaking the bank. The biggest highlight of the Echo is the 2.5" woofer that sits in the middle of the speaker providing a good amount of bass for the size. 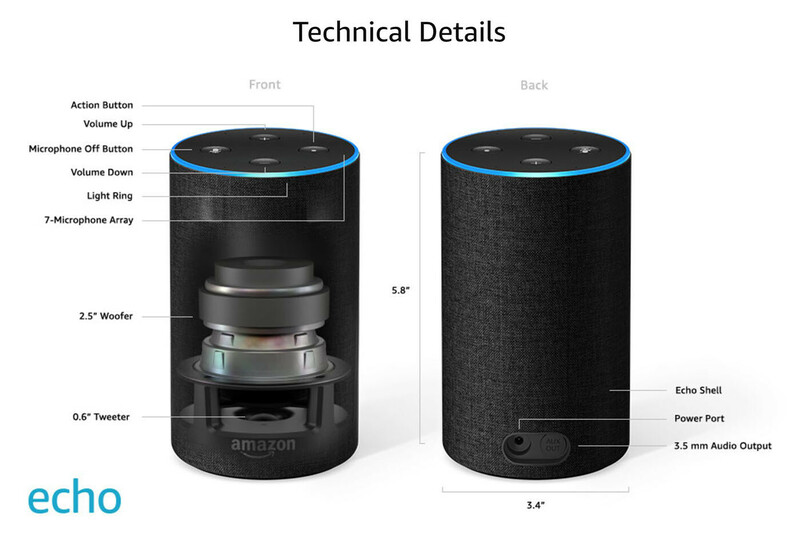 Below it is a 0.6-inch tweeter, while at the top you have the multidirectional, 7-microphone setup that allows Alexa to hear your voice from pretty much anywhere in a room. The Echo Plus is just slightly larger than the regular Echo, but it has a chubbier, more rounded look and even bigger sound. In fact, it is the sound quality that should draw you to this speaker, as it's the best of the bunch for music playback. Not only this, the Plus is also a smart hub, which means that if you have a smart device that is not Alexa-integrated, you could still use the Plus to connect to that smart device. And you also have a temperature sensor on board, which might be quite handy. Amazon ups its game in the Plus with a 3-inch woofer in the middle of the Echo Plus, complemented by a 0.8-inch tweeter that take care of the booming sound, while up at the top you have the signature 7-microphone multidirectional setup. The $200 Sonos Play 1 is one of the most popular smart speakers out there, so let's talk about it! With a sleek design and very good audio quality for the price, the Sonos should definitely be on your wishlist. However, it has its limitations: no auxiliary input to connect it to other speakers, for example, and no Bluetooth support. The great thing about Sonos is that the speakers are compatible with a wide range of streaming services, from the big ones like Spotify, Apple Music, Google Play Music, Tidal and more, to a lot of more obscure smaller streamers and even Audible. If you connect multiple Sonos 1s or Play 1s, you can get truly incredibly well sounding multi-room audio. It's impressive to see how audio levels stay consistent in different rooms even as you move around. And in terms of smart functionalities, you have support for Amazon Alexa with its vast arrange of skills. 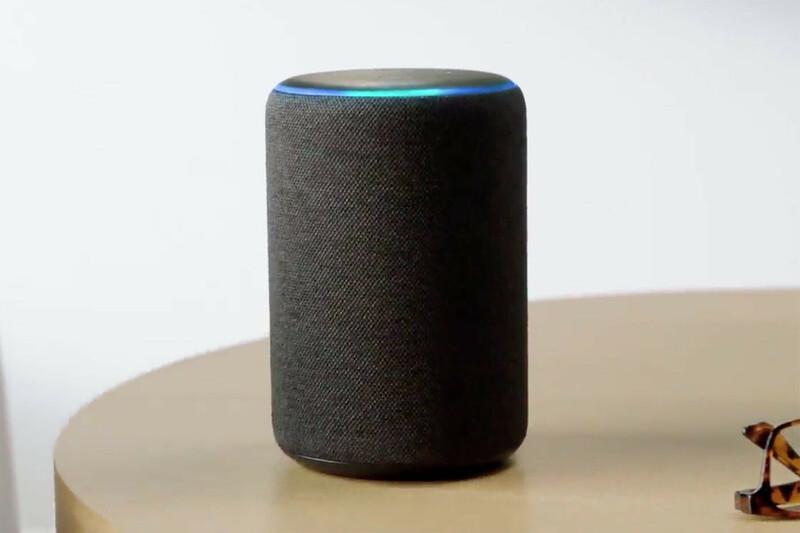 Google rushed into the smart speaker game after the tremendous success of Amazon's Echo speakers that became a true household item in 2017 in the United States. 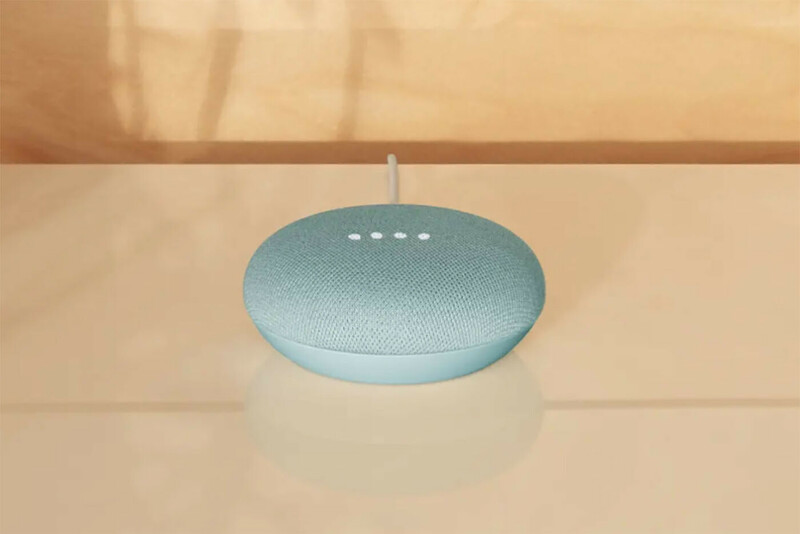 Google has a lineup of three speakers, from the tiny, hockey puck-sized Google Home Mini, to the original Google Home with its cute replace-able bases to - last, but not least - the big and impressively sounding Google Home Max. All of them are powered by the useful Google Assistant that knows more about the world than any other voice assistant out there and works in most languages. The Assistant can also keep up a conversation and stay in context, something that others are not that capable of doing. What are the main differences between these three? Obviously, sound quality is one: the bigger the speaker, the better its sound quality, and the Home Max is one of the best smart speakers in terms of quality out there. The Home Mini lacks an AUX port, while the other two have it (but the Home Max has a slight latency issue with it). 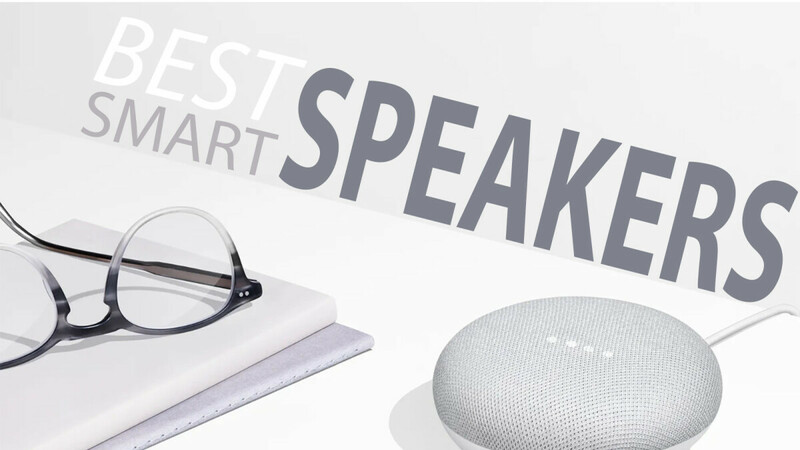 The most affordable of the bunch, the Google Home Mini, happens to be the most popular smart speaker out there (beating the Echo Dot narrowly), according to data by Strategy Analytics. So what is so good about it apart from the killer price? The Mini is all about bringing the Google Assistant to the most people possible and the Assistant does best in terms of fluid conversation. Google's smart helper can maintain a conversation for much longer than the competition as it understands context: you can ask it about the weather today and then continue asking follow up questions about tomorrow, the next day, another city and so on. This contextual awareness also applies to the Mini's general knowledge as it can keep a conversation about various topics. 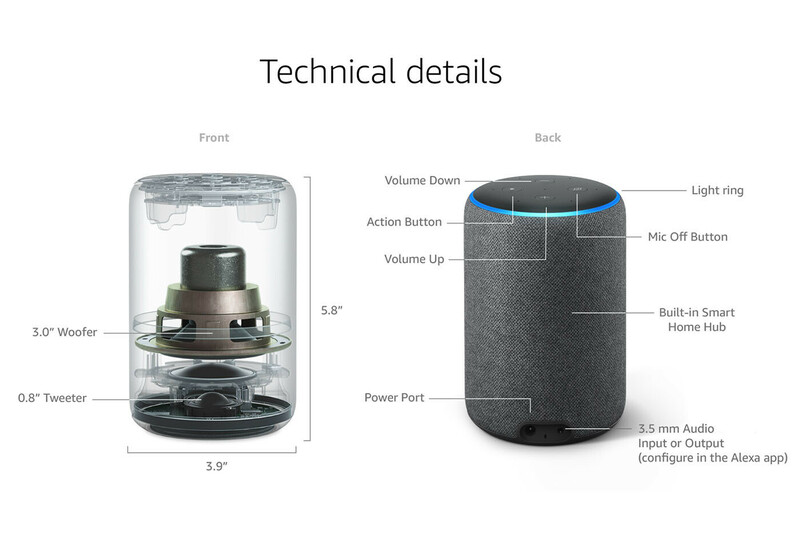 One area where it's slightly behind the Echo Dot, however, is the 3.5mm AUX audio jack, which is missing on the Home Mini, so there's no way to connect it to your traditional speakers. And in comparison to the bigger speakers, here you have a 40mm main driver unit. So how do you control the almost button-less Home Mini? Well, adjusting the volume happens via simple taps on either side of the speaker and you would see the volume level in the four LED indicators at the top. The speaker is also equipped with a non-slippery base, which is a clever decision. The Google Home is a bigger speaker that has bigger sound than the Mini, and this really is the main difference. 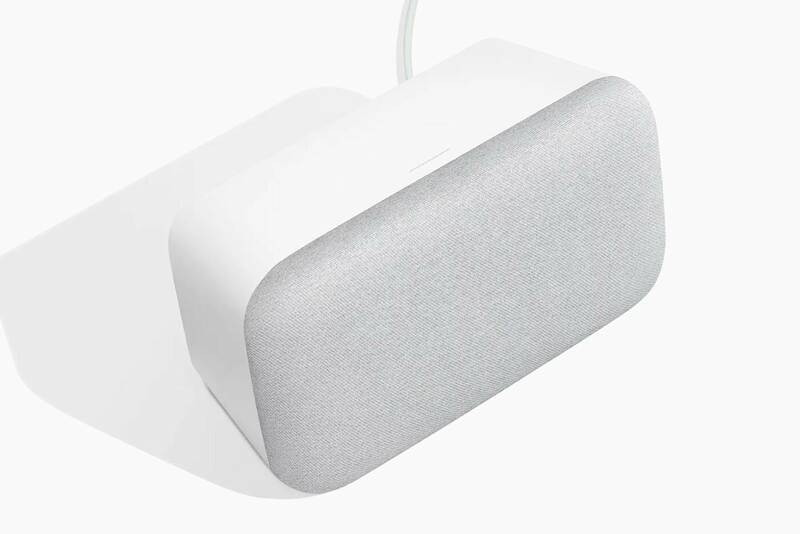 While the Mini is great tool for using the Google Assistant in your home, the regular Google Home is a much more enjoyable music listening experience. Again, the regular one is not nowhere near anything great-sounding, but at least it has some bass and depth to it, unlike the Mini. Finally, the much bigger and bulkier Google Home Max is all about that sound as it aims to deliver sound quality that you can actually enjoy. The Max fills up a large room easily and brings you a level of musical enjoyment that you can compare with more expensive speakers, yet at the same time it blends so effortlessly with home interiors and is controlled with your voice. The $350 Apple HomePod is a speaker with a focus on great sound quality and it impresses in this endeavor. While you usually associate great sound with big speakers, the HomePod is a speaker that measures just 6.8 inches high and 5.6 inches wide, bigger than the Google Home, but still clearly a very, very compact speaker. Obviously, it is not engineered just like any other speaker of its size. Inside, everything is carefully arranged and tightly packed to fit an innovative idea: "beamforming". 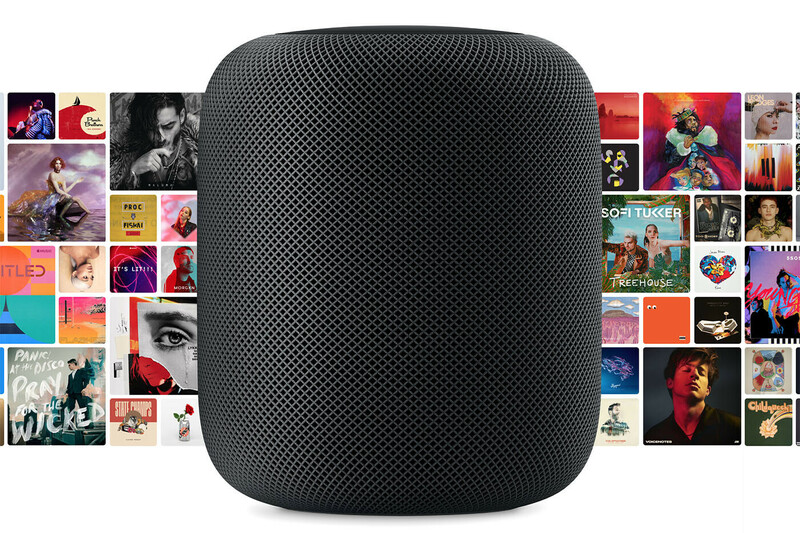 While most speakers place the woofer, the larger part of the speaker that is responsible for boomy bass, on the bottom, the HomePod has its rather large 4-inch woofer on the top. Then, on the bottom, tightly packed are not one or two, but a whole seven tweeters, each of them equipped with its own amplifier. Making it all work together is a circuit board in the middle with the Apple A8 chip, the same on Apple used on the iPhone 6 and 6 Plus, but tuned to the needs of a speaker. Additionally, there are six microphones around the center of the HomePod for Siri and one in the middle that measures the location of the woofer. The weakest part of the Homepod, however, is its "smart" side. Siri is simply not as knowledgeable as the Google Assistant, nor it is as useful as Amazon's Alexa. But if sound quality is what you're after, the Homepod delivers. This is a quick guide through the vast and growing space of smart speakers this year. What is your preferred smart speaker? Do you rely on Alexa, the Google Assistant or Siri? And are you planning to buy a new smart speaker soon? Look for the sale prices that were recently on for both Google's and Amazon's smart speaker Assistants. You just can beat it. It's definitely more convenient than using your phone. Plus if I want to play a video, or movie on my TV. Then there is definitely more steps involved with using my smartphone, than using say a Google Home Mini for $29. Not to mention control your home lights, or other appliances around the home. Listen for the sale price of $29 you cannot go wrong. Victor you reposted this again. It was initially posted back in January 2018. But you updated some things, and left out others. You updated the Homepod part. 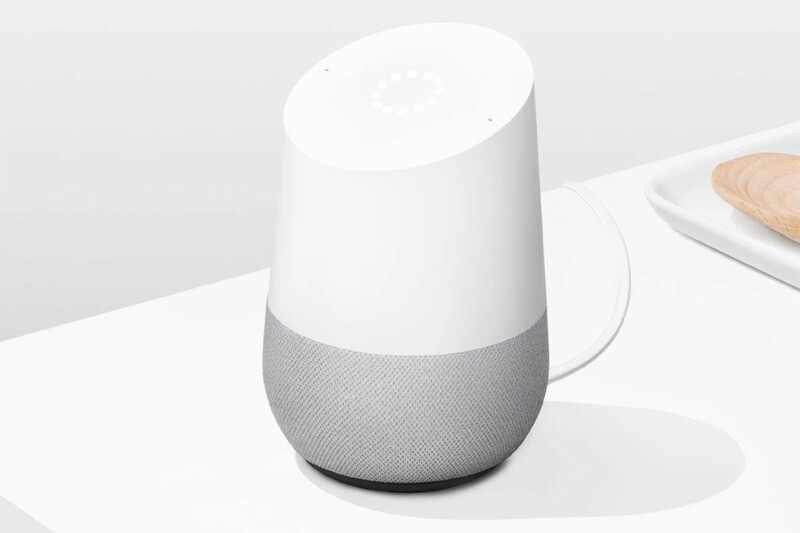 But left out the updates for Google Homes. Like you can put them in an audio grouping, or now a Chromecast grouping. Sure, they don't have and aux port, but they do support Bluetooth. Also both Google and Amazon offer smart displays with Googles Assistant or Amazon's Alexa as part of the smart displays. For instance there is smart displays with stereo speakers from LG, and JBL (Google Assistant). There is also large 10" and smaller 8" smart displays from Lenovo (Google Assistant). Google has a 7" smart display as well. These also have Chromecast capabilities built in, so you can cast everything but Netflix. Hopefully that will come soon enough. Amazon also offers a few different sized smart displays as well. They can play Amazon prime, but no Netflix. If you ask me these are much better than the speaker by itself. Well worth it if you can get them on sale. How could you have looked at Apples Homepod especially when it hasn't been released? As far as what makes a smart speaker intelligent is the context, which means it has to remember previous requests or conversations. People don't want to talk to a speaker where they must learn to talk to the speaker, or assistant, so it can understand you. Not to mention if there are multiple users as well. This gets into privacy concerns with Apple, but if you want a smart speaker with only your voice to understand context, then it's the cheapest option. Apple is looking to put a camera on their homepod, and use each users iPhone if it's near Apples speaker. This will really raise the cost of their smart speaker. So users can forget about an inexpensive smart speaker from Apple. Like the recently sale priced $29 Google Home Mini's or $29 Echo Dots. Besides for many cases I don't care about the audio quality for a search request, or to look up some information, or set an alarm, or an event. Apples Homepod will be a niche product at best. For everyone else the other options (Google, Amazon) are going to be used for the vast majority. > How could you have looked at Apples Homepod especially when it hasn't been released? Yep. And the Cortana powered Harman Kardon Invoke, which has been shipping for a while? Not a word about it. I have two Echo Dots and an Echo Show, and I have enjoyed them immensely. I have the Echo Dots hooked up to an external speaker (primary reason why I chose it over the Google Home Mini since that doesn't have an aux out) and with multi-room audio it just envelopes you with sound. Looking forward to getting the Echo Spot when it will inevitably go on sale this year for Black Friday or Amazon Day. Have the Echo large Better sound than google home But I also have the Google Home/Mini mainly because I don't want to subscribe to music, & I have uploaded my 12,000 ish songs to google for free. The Apple Pod hasn't been released and gets mentioned. The Harman-Kardon Invoke is out and not even a whisper. Funny though that Cortana is supremely more talented than that bubble-headed blonde Siri. Anybody catch the Invoke being used on the fall finale of Hawaii Five-O? Bought the Echo Dot 3rd Generation on Black Friday for 30$. So glad that I’ve bought it.